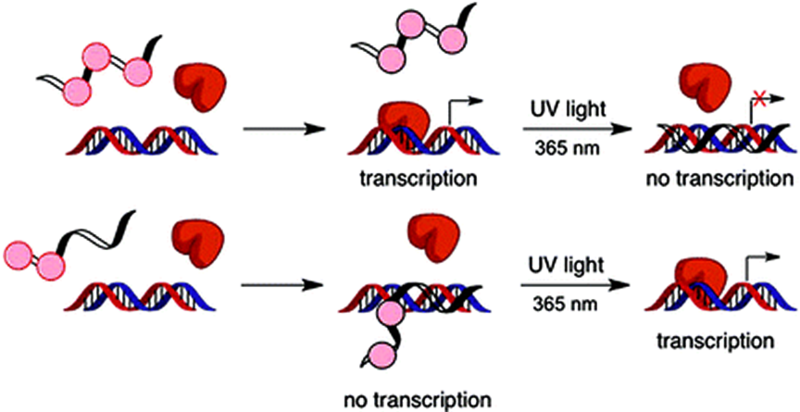 removed, and the Triplex-forming oligonucleotides is free to bind with DNA, inhibiting transcription of the gene of interest. A caged inhibitor strand was attached to the triple helix forming oligonucleotides. In the absence of UV light, the TFO behaves normally, binding to DNA and preventing gene expression. However, when exposed to UV light, the caged inhibitor activates and stops the TFO from binding with DNA, turning gene transcription on. In short, Scientists have created a tool that allows for the light-activation of genetic transcription. [Read this article for details] .